If you are reading this, then you are likely interested in what Wealthy Affiliate is and how it can help you. You want to know how to make money with Wealthy Affiliate. Wealthy Affiliate teaches you the skills and provides you with the tools you need to tap into the online money making market. With time, focus and effort, you will create websites or blogs that are setup to make money online. There are many ways you can make money with an online website. Each way has its benefits, pros and cons. Every way requires require effort. No money is made without any effort! So without further ado, here are 10 real use case examples of how you can make money with Wealthy Affiliate. You can recommend other people’s products on Amazon. You make commissions for each sale you refer for those products. This is referred to as affiliate marketing. It is the idea of selling other people’s products. Amazon is one of the most popular places to recommend products. Who doesn’t know of this e-commerce giant? Who hasn’t bought something online from Amazon? Amazon is a multi-billion dollar company selling products from many categories. The benefit of recommending products on Amazon is that it requires minimal investment. You do not have any overhead with other people’s products. You do not need to buy the products in bulk and store the products and ship them out to buyers. You just generate traffic to these product pages online through your Amazon affiliate links. Affiliate links contain a tracking number for your affiliate account. It’s used to track the sales referred by you so you get paid. Amazon is the largest internet retailer online and has over 500 MILLION products for sale. This provides you with a huge selection of products to promote. The large selection makes it easy to recommend multiple products from one place. And Amazon is one of the easiest affiliate programs to join. Although Amazon is easy to join and offer over 500 million products, Amazon’s affiliate commission rates are lower than other affiliate programs. The commission rates range from 0 – 10% depending on what products you promote. You don’t make any commissions if you promote Amazon gift cards or wine. You can make higher commissions with other programs, but they may offer you fewer products to promote. Another con is, Amazon is very strict about their terms of service. It is easy to get banned from Amazon’s affiliate program if you do not strictly follow their rules. A great Wealthy Affiliate example is Football Snack Helmets. Jay Neill is the Wealthy Affiliate Live Training Coach. He provides live training sessions every week, covering various topics on affiliate and online marketing. Jay created Football Snack Helmets as part of a Live Class Case Study training series. Can you guess what this site recommends? Yes, football snack helmets for your favorite NFL team. Pretty simple enough right? 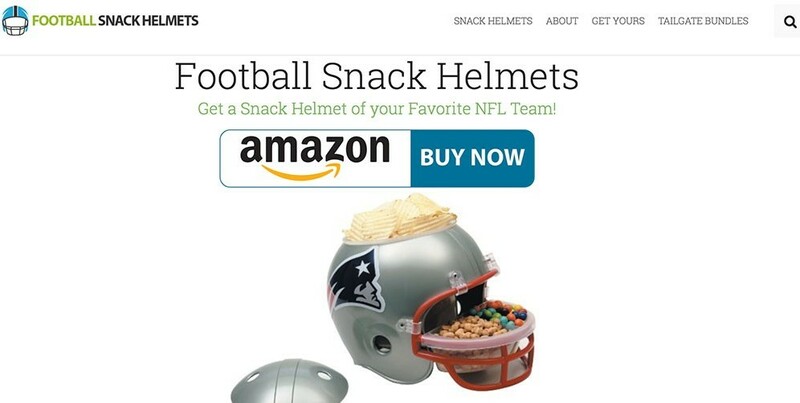 These football snack helmets are available on Amazon. If you are interested in buying one from Jay’s website, you will be redirected to Amazon to purchase. Jay just sends traffic to Amazon for these helmets. Amazon handles the product storage, the payment and the shipping. Guess how much money Jay has made online with this one website? How about $1000 per month during football season! Here is proof from a blog post on Wealthy Affiliate stating Jay’s success with Football Snack Helmets. All training like these are created for Wealthy Affiliate members, to help you learn how to become a successful affiliate marketer. These type of case studies allow you to watch over Jay’s shoulder as he builds out a website that is designed to make money over time. He shows you exactly how he does it. Step by step. You just need to devote the time to do it for yourself. You can recommend Apple iTunes Music, Movies, TV, Mac Apps, or iBooks. You make commissions on referrals you send who purchase within 24 hours. In order to promote these products, you could write helpful content reviews on specific music, movies, apps or books. The goal is to help people decide which ones are the right one for them. Once again, you have minimal cost, time and effort with affiliate marketing. You do not need to worry about the upfront cost, storage or shipping for any of these products. You just have a website that sends traffic to these products, using your affiliate links. Wealthy Affiliate will provide you with everything you need to learn, launch, manage, and drive traffic to a website. People buy apps! Apple had $890 million in purchases and downloaded apps in 7 days during the 2017 Christmas season. This means people are buying Apple Apps. Like CRAZY! That’s an existing market for you to tap into. The commission rate is 7% for iTunes Music, Movies, TV, Mac Apps, Mac In-Apps, iBooks, and paid apps. The commission rate for iOS In-Apps purchases is 2.5%. Commissions will be low. Apps are low priced items. Cost of paid apps can be as low as $0.99 or higher priced at $9.99. 7% commission on 99 cents is $.07 cents. 7% commission on 9.99 is $.70 cents. As you can see, you’ll need a lot of sales to make the dollars add up. Recommending iTunes products would be one of your multiple affiliate strategies if you went this route. Meaning, you would have other affiliate products you promote. You would not want to rely on iTunes sales alone. Wealthy Affiliate has thousands of members who are affiliate marketers for various affiliate marketing programs. These members promote a wide variety of products. You can easily find other members who are part of affiliate programs you may want to know more about. You can search for your topic or ask a question to the community. You can read updates from Wealthy Affiliate members to know what they are accomplishing and what affiliate marketing programs they are using. Here is an example of how Wealthy Affiliate member, Fleur Allen, uses the iTunes affiliate marketing program to promote books on her site. If someone buys a book from her iBooks search, Fleur gets a commission for that sale. You can recommend Wealthy Affiliate to other people who are looking for ways to create money online. Wealthy Affiliate has a robust affiliate program with a high commission payout. You promote the tools, the training and the support community to help someone else learn what you can learn. Note: These commission rates are for Wealthy Affiliate premium members. Commission rates are lower for free starter members. But yes, you can still make commissions with a free starter membership. Wealthy Affiliate is designed to train you how to be an affiliate marketer. It offers a step by step training courses and all the tools you need to teach you how to make money online. You will learn from a seasoned affiliate marketer and Wealthy Affiliate co-founder, Kyle. He teaches you exactly how to build a website that in time and with effort, can generate referral leads to Wealthy Affiliate and sales for you. The product you will recommend is already chosen for you. You don’t have to figure out what you want to recommend. This makes it easy to get up and going, promoting a product that people generally love. Wealthy Affiliate has over 800,000 members and been established for 13 years. Wealthy Affiliate also offers up to 48% commission payout if you are a premium member. You can make up to $175 for one yearly premium membership sale. This affiliate commission rate is higher than Amazon and iTunes. Wealthy Affiliate is a specific product for learning online marketing, affiliate marketing, managing websites and interacting with a large member based community. It usually targets people who want to learn how to make money online. You need to be a Wealthy Affiliate member and actually use the products. You need to think Wealthy Affiliate is a good solution for people before you recommend it. If you recommend a product or service that you don’t really believe in, you are far less likely to ever see any money from it. You goal should be to show people how Wealthy Affiliate can help them build the future they desire. The Wealthy Affiliate Bootcamp contains 70 lessons that walk you through each step. You will learn everything from how to launch a WordPress website to how to market your website. We’re talking useful digital marketing skills such as websites, SEO, content marketing, social marketing, pay per click advertising (PPC) and more. You not only learn what you need to do, but you actually complete tasks within each lesson. You actually build your online business while you learn. You have all the tools you need with Wealthy Affiliate to learn, build, connect and succeed as a successful affiliate marketer. Here is what you will learn with Wealthy Affiliate’s Affiliate Bootcamp training course. Here is an example of a Wealthy Affiliate (WA) member who has made money on WA referrals. You can create training on Wealthy Affiliate, to help other members learn something they didn’t already know. You get credits when people engage with your training. These credits can be used for features that help you with your websites. These credits can even be cashed out for real money. There are multiple levels of payouts. You can make $5 for completing level 1. Completing a level requires a minimum number of visits, likes, and engagement with your training content. The higher the level, the more engagement actions are required, the higher the payout when the level is complete. The amount of levels your training completes depends on how many people use it. Creating training is a great way to help people and share your expertise. It’s a great way to become a recognized expert in online and affiliate marketing. Leveraging other members’ training is a great way to learn about specific topics of interest. The different credit levels allow you to earn money for your training over a long period of time. The credits earned can be used to buy website domain names or cashed in for money. Either way, you make money or credits that can be used to buy more things. Creating training on Wealthy Affiliate is an easy way to make additional money. You need to be a premium member of Wealthy Affiliate for three months before you can create training. This govern is to ensure that you have enough experience to create high quality and relevant content for other Wealthy Affiliate members. Also, if you are new to affiliate marketing, this may sound intimidating. The good news is, you will learn everything you need to know at Wealthy Affiliate. When you are ready, you can create training on Wealthy Affiliate on a particular topic for other members to learn from you. Wealthy Affiliate has hundreds if not thousands of training created by members. These trainings are in addition to the Online Entrepreneur Course and Affiliate Bootcamp training courses provided by the founders of Wealthy Affiliate. For example, if you want to know more about the Amazon affiliate marketing program, you just search for it! Here is an example of the training results available when you search for “Amazon”. Good Samaritan disclaimer: I haven’t created any training so I haven’t made money (yet :). You can promote companies services. The idea of recommending services is the same idea as recommending products. Did you know that many large service companies have affiliate programs? If you’re interested in recommending services that help people with their homes, you could promote ADT Home Security through one of ADT’s authorized premier provider partners, Protect Your Home. I know this may sound a little crazy. However, if you are a contractor, home remodeler or handy man, its easy to recommend other home related products and services to your customers. Why not make money for the referrals? With Wealthy Affiliate, you can host websites and promote just about any product or services you want. Recommending services for people’s home is personal. Suggesting services that make people feel safe is an easy way to connect with people and help them. Say you have ADT services and you love them. Why not provide others with the same great service and protection you feel. And you can get paid for the referral! ADT has been around a long time. The service is available nationwide, has home automation features, voice control options, and remote access. It’s easy to promote a service that is credible and backed by you. Recommending products for your home is a defined market. If you’re not interested in researching the best home services, then this market would not be for you. But don’t worry, hopefully you are seeing there are plenty of other markets and affiliate programs you can tap into. ADT is not the only home security service you can promote. There are many other affiliate marketing programs you can leverage. Here is an example of Safewise who promotes various home security systems in local areas. If you click on the view packages links, you’ll notice that the link you are about to click on contains an affiliate ID number. This number associates any referrals back to SafeWise. If any person on their site purchases the services through their website, SafeWise will get a commission for that referral. You can promote home improvement products. Home Depot is a successful nationally known home improvement retailer. With Home Depot’s affiliate market program, you can earn commissions to sales you refer to homedepot.com. In Home Depot’s case, the affiliate program is managed through CJ Affiliate by Conversant. CJ Affiliate by Conversant is an affiliate marketplace program with thousands of products to promote. Large retailers such as Home Depot choose CJ Affiliate to manage their affiliate programs. If you become an affiliate marketer with CJ Affiliate, you can promote products from other retailers. This expands the type of products and services you can recommend. Did I mention most affiliate programs are free to join? You don’t have to pay into the affiliate program to promote Home Depot. You do have to pay for a website or blog that promotes the services or products. And your website or blog needs to be relevant to the products you are promoting. Meaning that if you are going to promote Home Depot products, your website should be related to home design, building or improvements. If you’re not into promoting home improvement products and services, then this is not the right promotion for you. Also, it can be a bit frightening to think that you need to launch a website in order to make online. It’s not as scary as you think. There are many great tools and ways to learn how to do this. You have so many choices. 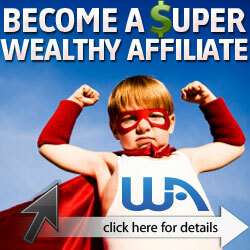 Wealthy Affiliate is definitely a great choice when looking for website services and training. You will learn how to choose an industry relevant to you and learn how to promote it. You will also learn about all the various affiliate programs available and how to search for ones that fit you. You will have all the tools such as website hosting that you need to launch these types of websites yourself. You can promote new drivers and car rides for car sharing services. Lyft is an on-demand transportation company that picks you up and drops you off where you need to go. It’s basically the new age version of taxis. Lyft is rivaling competitor of Uber, a company that offers the same type of on the go driving services. Both Lyft and Uber are always looking for more drivers in various areas. More drivers means they can handle more demand and both the drivers and the companies make money. With Lyft, there are actually two ways to make money here. The way to make money is to promote people to sign up to become Lyft drivers, on your website made within Wealthy Affiliate. You can can make up to $35 per person who signs up. The other way to make money without Wealthy Affiliate is to become a Lyft driver. Sometimes, Lyft offers sign up bonuses for new drivers. Here, you can make money promoting Lyft to drivers or actually being a driver yourself. Some companies have high standards when accepting affiliates into their affiliate program. Lyft is one of these picky companies. You will need to have a website with established traffic before you apply to promote Lyft driver services. Otherwise, you’ll be turned down if you don’t meet Lyft’s criteria. Ridesharing Driver is an example of a site that promotes ride share services including Lyft and Uber. Since it is a website specific to ridesharing services, promoting Lyft and Uber ads are very appropriate to display. When someone signs up to be a Lyft driver through the ad below, Ridesharing Driver will get the commission for that sign up. Another way to make money with Wealthy Affiliate is to allow advertisements to be displayed on your website. Google has its own product called AdSense. With AdSense, you give Google permission to displays ads from their ad network on pages and various areas of your site. The ads served are meant to be targeted to the content and the audience you have. When someone views or clicks the ads from your site, you get a commission. Google has a huge network of advertisers. A huge network of businesses who want to tap into Google’s network for visibility of their product or service. Google Adwords is the online advertising service product developed by Google, where advertisers pay to have to their ads displayed. Where the ads are displayed is all controlled by Google and the AdSense product. Just to be clear, Google Adwords is the product to buy ad space. Google AdSense is the product that display the ads. Google controls everything. You simply pay to have your ads displayed on other websites that you do not own or allow other business’ ads to be displayed on your website that you own. Google is a leader in the digital space and provides all of the tools you need. Making money from Google ads is pretty easy compared to other ways you can do it. You just say, “Hey, Google, use my site! Display your ads here and here”. Setup is easy because you simply partner with Google and they do the rest. They manage the ad buying process and which websites the ads are displayed on. Google AdSense can be hard to get approved for. And commissions are going to be to low. How much you will make is completely dependent on how many clicks or views the ad gets from your site. In some cases, you may make $1 for 1000 impressions or a few cents per click. For more commissions, you must have a good amount of traffic for more clicks and views. Once again, to get approved for Google Adsense, you need to have a well-established website with great content and a good amount of traffic. But the good news is, that your site can be about any topic and Google will likely have a relevant ad for it. Here is an example of a local Corpus Christi, Texas TV channel website. They have various ad spots throughout their website. One place is at the top of the site which is referred to as a banner ad. You can tell it is an ad because “AdChoices” is displayed at the top right of the ad. When you click on the “AdChoices” link, you are taken to the Google’s support sites about Google Ads. This is an example of a Google ad being displayed on this local TV station’s website. Wealthy Affiliate provides you with the tools you need to create websites and training on how to set up your site for advertisements. If you didn’t want to use an advertising network partner such as Google, then you could also manually sell ad spaces on your websites to businesses. You designate the ad spaces, the price you want to charge and then promote your ad spaces to companies who can advertise their product or service to your website audience. This is a much more profitable way to make money off your ads. You can charge anywhere from $25 – $1000+ a month per ad space. Some magazines charge as much as $2500 for the banner at the top of the page. How much you charge is based on how much traffic you can generate to the businesses who buy your ads. This model is commonly used with local newspaper and magazine websites. Just like they control the ad spaces they sell in their newspapers and magazines, they control the ad spaces on their websites. The advantage of this way is you make more money with self maintained ad space. You control how much you make with each ad. You make more profit for the time you spend on developing your website and driving traffic to it. Managing your own ads is a very manual and time-consuming process. Not only do you have to manually control the display of all the ads, where they go, you also have to market your ad space. You have to go find businesses that would be willing to buy ad space from you. And if you sell ad space for a monthly basis, you have to manually keep up with the schedules of these ads, when they display because they are paid for and when they do not. This way is not recommended for most businesses. Newspapers and Magazines commonly do this because they need revenue generators to keep their printed publications alive. The more common way to make money from ads is to just partner with popular ad networks such as Google, MediaMath, AdRoll, etc. Here is an example of how Time Out sells their digital ad spaces on their website. This is Time Out’s advertising spec sheet which communicates the requirements for their online ad spaces. The photo above shows you the Time Out website with ad spaces on the right side. The top right ad is an ad powered by Google AdSense. The bottom right ad is a direct ad sold to a company. As you can see, once you designate spaces for ads, you can combine methods together to fill them with actual ads. You can have a website where you sell your own products. Your products can be anything under the sun such as graphic t-shirts, birthday cards, hand-made jewelry, one of a kind artwork, dog toys, etc. Whatever quality product you can make or buy, you can sell. Selling your own products such as t-shirts or dog toys allows you to make more money off of the products, compared to recommending other people’s products. While commissions for product referrals can range anywhere from 0 – 47%, selling your products can yield up to 75 – 85% depending on the difference of what the product costs you to make or buy vs. how much someone is willing to pay for it. You have more control of how much you make for each sale. The lower the cost to make or buy the product and the higher you can sell the product allows for higher profit possibilities. You will make more money but you will definitely spend more money with this way too. Selling your own products requires more work. In addition to driving traffic to your website to generate sales of your products, you need to either make the products or buy the products in bulk and resale them. If you sell your own products, you have to manage the buying process, the payments, the shipping and the return processes. If you buy products in bulk, you have to manage storage of the products. If this process sounds like too much, you could pay another company to do that for you, which is called drop shipping. This way is not recommending for starting out. Begin with referring other people’s products and learn the ropes of what it takes to get commissions for product referrals. Then look for another ways to monetize your website. Planet Dog is an example of a website that sells dog toys. When you buy products from this site, Planet Dog manages the payment options, the sale, the shipping to you and customer support if needed. Helping people is the core foundation of the Wealthy Affiliate principal. It was created to help people to learn about affiliate marketing and capitalize on the opportunities of the internet and online marketing. You will learn how to build a website that promotes products found on Amazon or any available affiliate marketing program. If you leverage the training, products and people within Wealthy Affiliate, you can learn how to launch an online business and make money from it. If you already have some understanding of the internet world and business, you can leverage Wealthy Affiliate to learn how to execute different types of digital marketing strategies to grow your business. And stay up on the latest trends of the digital marketing world. 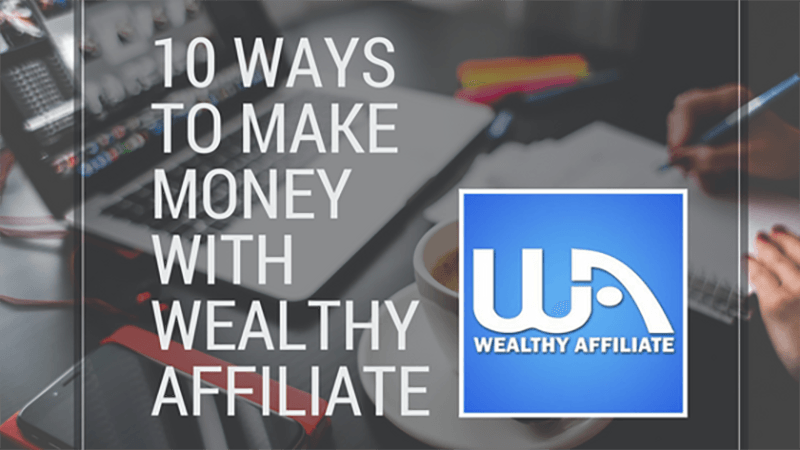 Want to know more about Wealthy Affiliate? A great, comprehensive look at the online community, Wealthy Affiliate. Kim you have articulated all that you receive as a member so well. I know I was sceptical before I joined, thinking can this community really be so good? And yes it is. Kim, you are an active example of this supporting other members such as myself and featuring several of our websites here to demonstrate the membership in action. If you’re reading this and are unsure then follow Kim’s links to try out the free version (I did and upgraded within the week to Premium). Thank you Fleur! Your site is a great example to show the endless possibilities of what can be done with a website. Happy to feature your example. Wealthy Affiliate is just too good to keep a secret 🙂 I upgraded to premium in 3 days after signing up for free.